Very interesting, this is the best post! How nice to have a dove at home, you are so lucky. I'm glad you liked it Vue Jardin. I just hope one of them actually hatches. In Pearl Buck's "Pavilion of Women", she says the Chinese consider it lucky when a wild creature is in the home; that means it considers your house a part of nature. So you are extra fortunate, I think! What great pictures and what an occupying event to watch. Yes Pomona. Thanks a lot for this lovely comment. I do believe that is true. 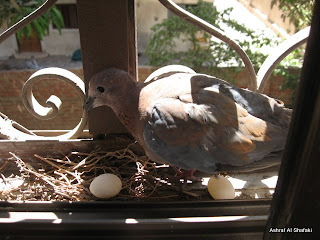 That is exactly the feeling I got when I found the dove nesting on my window sill. I felt that the plans I grow in pots in my balconies have finally given the birds a sense of 'nature' and that the house is more natural and peaceful. It's interesting how after reading some verses of the Quran (the holly book of Muslims) I found the dove closing its inner eyelids (actually its nictitating membrane) which I took to be a sign of feeling peaceful for I haven't seen it do that before! As I stopped reciting the verses and looked at the Dove I found it opening its inner eyelids again. Was an interesting experiment. That is a very beautiful picture of a very cute bird! 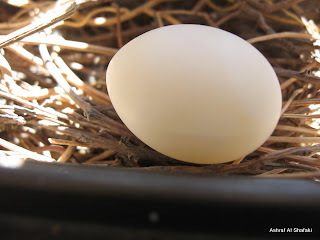 I am looking forward to visting Egypt and seeing a wild dove myself.